Let's take a look at some examples of tasks that would be easier to do in OptoScript. Math expressions are simpler in OptoScript, and many of them are built right into the language. For example, you don't need PAC Control commands called Add or Multiply. 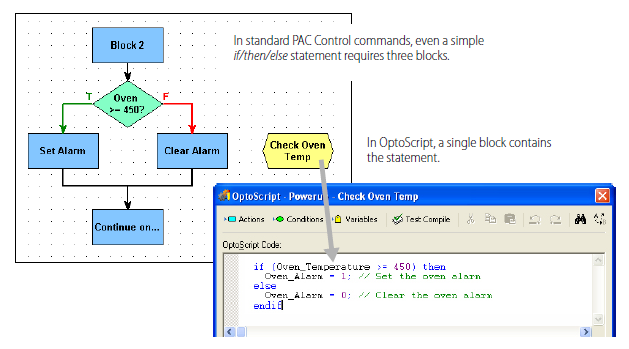 To do the same using standard PAC Control commands, you'd need to create at least two intermediate variables and use five instructions, as in this example. 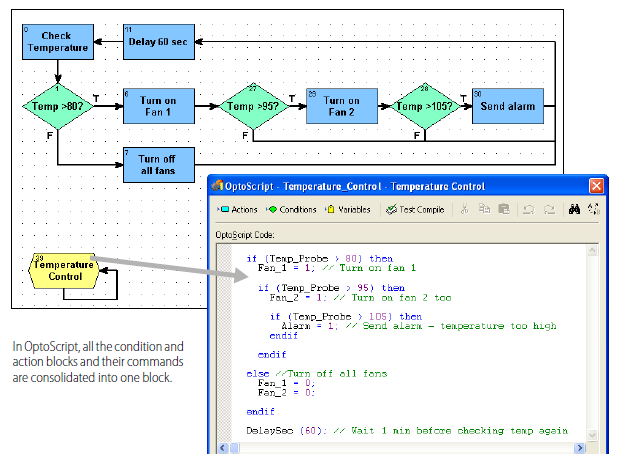 If your strategy sends and receives serial data, you'll want to use OptoScript code. 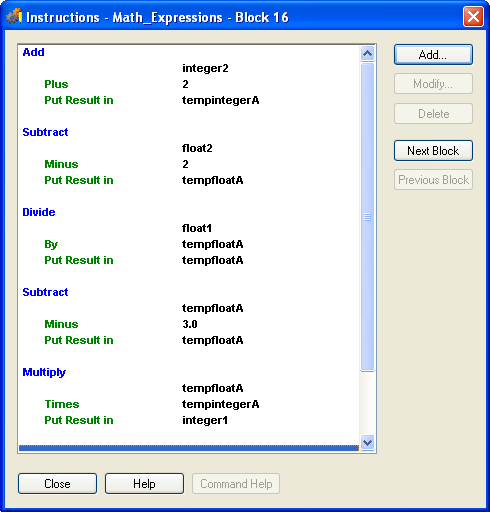 In standard PAC Control command blocks, forming and parsing (decoding) serial data can take several blocks. In OptoScript, string handling is easier. 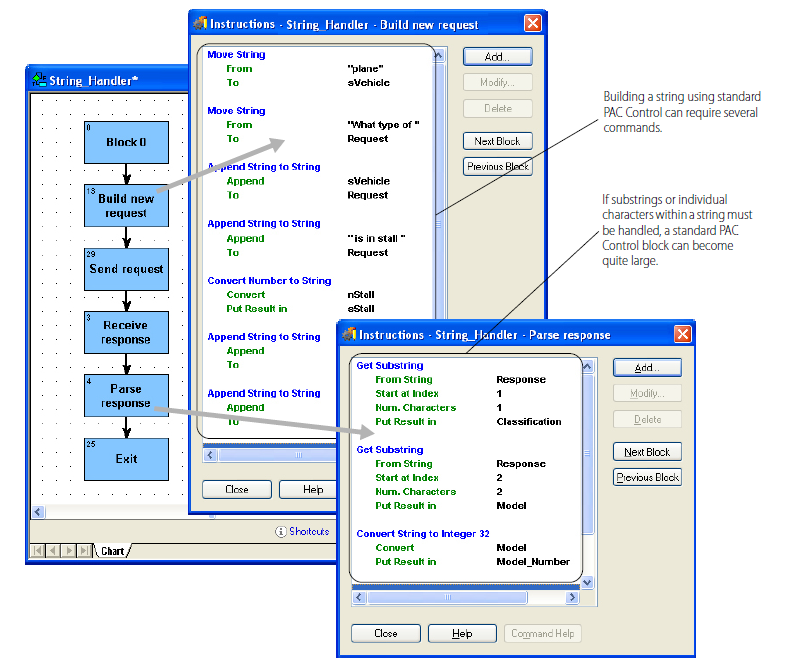 Here's a flowchart that sends the string request, “What type of plane?”, and parses the response. Compare these blocks and instructions with the ones done in OptoScript. 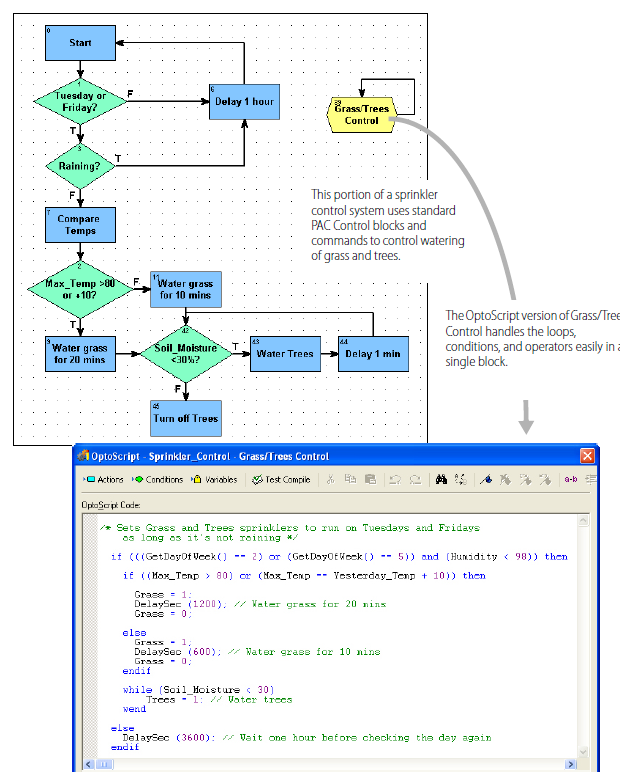 Strategies that use complex loops—for example, to repeat an operation while a condition remains true—are easier to create and take up less space in a flowchart when done in OptoScript. While loops, repeat loops, and for loops are all available. While loops: Repeats a process while a test is true. The test is done at the beginning of the process. Repeat loops: Repeats a process until a test is false The test comes at the end of the process. This type of loop executes the programming code at least once. For loops: Repeats a process for a specified number of times. 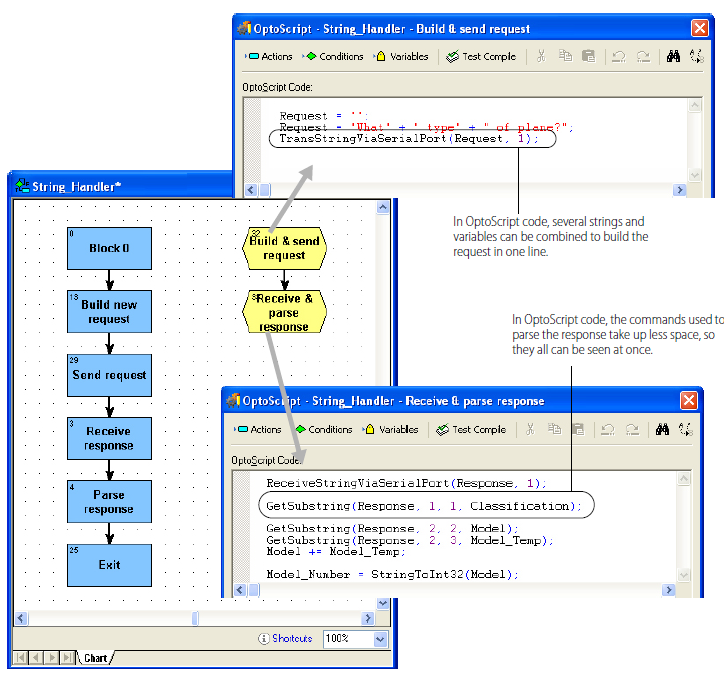 Below is an example of a while loop as it would appear in standard flowchart commands, contrasted with the way it could be handled in an OptoScript block. 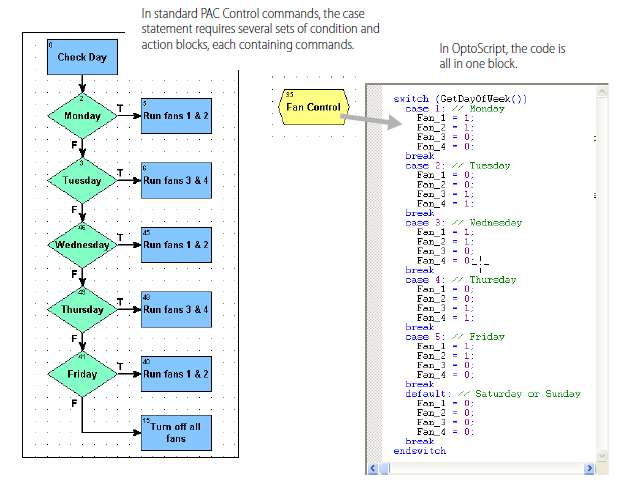 The real power of OptoScript can be seen in complex operations. In summary, the more complex the combination of math expressions, logical and comparison operators, loops, and conditions, the more convenient it is to use OptoScript code rather than standard blocks and commands. 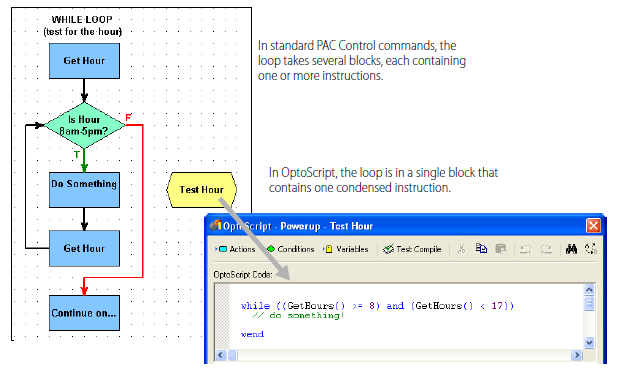 This lesson takes a look at some examples of tasks that would be easier to do in OptoScript than in PAC Control blocks.